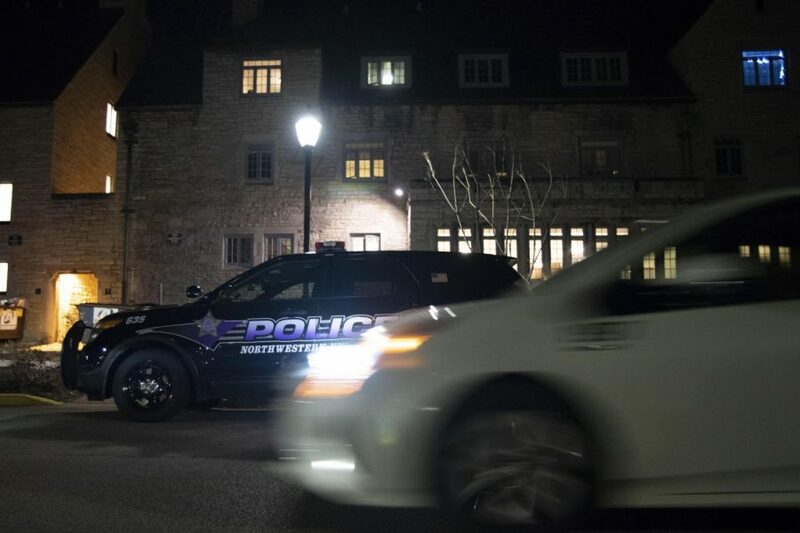 A Safe Ride drives past a University Police car near the Sorority Quad. Safe Ride is temporarily suspending its three block ride minimum in light of recent reports of men targeting women on Northwestern’s Evanston campus, according to a Thursday email from Patricia Telles-Irvin, the vice president of student affairs. In the email, Telles-Irvin told students to be patient, as wait times for the service may increase due to the suspension of the minimum distance. Wait times often range from around five minutes to half an hour, but can be over 40 minutes as well, according to Safe Ride’s Twitter account. Safe Ride, a free ride-sharing service that shuttles students and other NU community members to and from campus within Evanston city limits, operates every night from 7 p.m. to 3 a.m. when classes are in session. The change was made after University Police received reports of men harassing women or grabbing them from behind and following them down the street. Five incidents have occurred since Oct. 28, and have provoked fear among members of the NU community. Campus Loop and Evanston Loop shuttles will also extend their run times by an hour, starting at 5 p.m. and finishing their runs at 3 a.m. The email also suggests students avoid underlit sidewalks, avoid listening to music while walking and travel in groups whenever possible.